Despite the rainy weather, we managed to kick off two of our lunchtime music programs today. The forecast looks iffy for the rest of the week, but luckily there's a whole summer ahead to enjoy free music in the park. 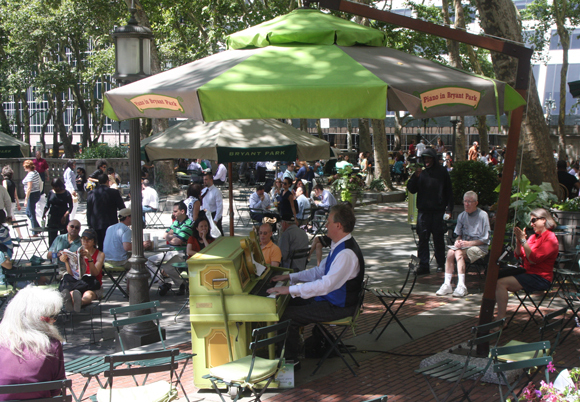 Our lunchtime Piano in Bryant Park series turns eight this year and opens with a week-long appearance by ragtime expert and stride pianist, Terry Waldo. Other favorites returning this season are pianists Junior Mance, Frank Owens, Todd Robbins, Victor Lin, and Ayako Shirasaki. Enjoy the sounds of Paris just across the park, as we introduce a second season of accordionists playing in the French-style. Catch Rachelle Garniez this week and keep your ears open for performances by the talented Benjamin Ickies, John Gee, Emilio Magnotta, and more throughout the summer. That's the May music line-up, but you can also look forward to Bryant Park After Work on Wednesday evenings beginning June 1. The series features talented New York area jazz musicians and singer-songwriters performing at 6pm on the park's Fountain Terrace...perfectly timed to start the end of your day! Check out the full line-up of musicians on bryantpark.org.